Procedural Destruction of convex shapes. Procedural destruction of convex shapes using Voronoi, at 240Hz simulation rate. I am happy with the stability of convex/convex intersections. Performance needs more work, as it goes below 30 fps. Re: Procedural Destruction of convex shapes. Your work became a lot clearer to me when I had a look at more of your videos on Youtube. I assume you want to make a nice 3D version of Flank-that-Tank. I think it would be cool especially if you use cool camera angles from outside the tank and not just first person from inside the tank. - Split screen option, play with a friend on the same TV screen. - One player commands multiple tanks/units to add more real time strategy. For example maximum 4 units, you drive them individually to where you want to attack the opponent (one at the time) and then you roll out your attack. For example while you command unit 3 the other units have a like A.I. to defend or attack incoming dangers. A bit like simplistic Command and conquer. Also I would like to suggest to add some explanation voice to your videos to clarify. Split screen severely limits size of audience. Most gaming is done single player, or else online multi player. I have to think how the destruction physics can be properly utilized in a strategy game. It's quite hard to make NPCs deal with changing environments. 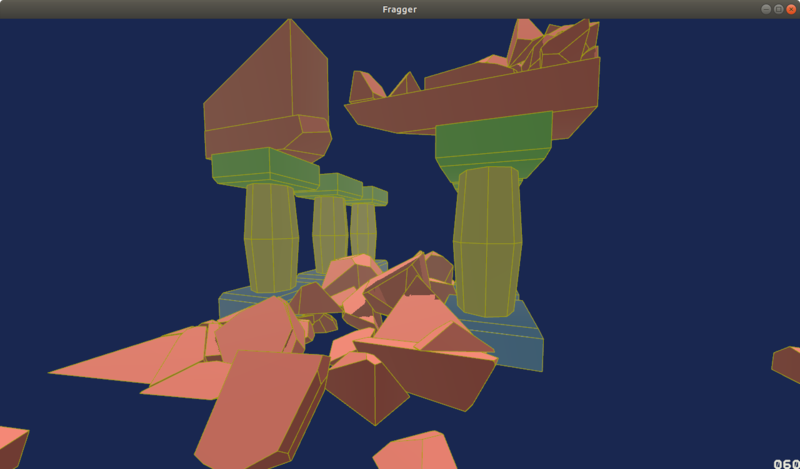 Some good progress with custom friction in collision callback.